Apple’s iPhone 4S is such a hit that retailers are pushing back delivery dates on some models of the new smartphone. In a statement, AT&T said it received more than 200,000 pre-orders for the phone in the first 12 hours, making it the most successful iPhone launch the company has ever seen. Indeed -- the demand was so high that both Apple’s and AT&T’s online stores went down for brief periods early Friday, when the phone went on sale for pre order. So many people have already ordered the new phone that Sprint, Verizon, AT&T, and Apple online stores are telling customers they’ll have to wait a little longer. The original delivery date was slated for October 14 when the iPhone 4S was announced on Tuesday, but Apple has now pushed back expected delivery one to two weeks. On its website, AT&T now says the ship date for pre-orders of the iPhone 4S could be as much as 21 days out, with even pre-orders of the older iPhone 4 8GB -- now selling for $99 -- expected to ship in 10 to 14 days. 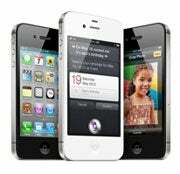 Sprint’s website says the 16GB version of the iPhone 4S will be in stores October 14 but is sold out for pre-order, although the 32GB and 64GB models are still available for online purchase. Verizon’s site says the 16GB version is available for delivery October 21, whereas the other models are still available on October 14. The extraordinary demand is likely due in part to the long wait consumers have had to endure between iPhone iterations. The iPhone 4 launched in June 2010 and in recent months anticipation for the latest version has been almost palpable. The iPhone 4S is priced at $199 for the 16GB model, $299 for the 32GB version, and $399 for the new 64GB version, all with a two-year contract. An unlocked contract-free version of the device that works only on supported GSM networks will be available beginning in November. The prices for the unlocked iPhone 4S are $649 for the 16GB model, $749 for 32GB, and $849 for 64GB. Apple is selling the unlocked iPhone 4S already in some countries, such as the U.K, Germany, France, and Canada.